The Korean Central News Agency is North Korea’s Xinhua, that is, an organ for propaganda and news. This past week has seen a number of significant themes emerging. On March 3 the paper posted on its Internet a report that there took place a “food robbery” in the northern region of the DPRK, claiming that the Information Center for Solidarity with NK Intellectuals, made up of such human scum as traitors and defectors to the south, obtained the “information from local inhabitants.” The information center is under the patronage of the south Korean puppet authorities. What is more intolerable is that the above-said paper even asserted that the incident occurred on February 16 [e.g., Kim Jong Il’s birthday] in a bid to make the story about the “incident” sound politically plausible. … [The] great irony is that the Sankei Shimbun is so nervous about gathering misinformation about the DPRK that it chose to echo the nonsensical talk made by human scum, lost to shame. But no one would lend an ear to the above-said misinformation. Those keen on the smear campaign will have to pay a dear price for their wrong doings. Clearly word is spreading within North Korea that the rest of us, that is, the international community, are getting news about what is actually happening in the DPRK and, moreover, that the North Korean government is becoming more publicly concerned about the normalization of the sharing of information (for pay or otherwise) via cellular phone. After the opening of Rajin port to China for the next ten years, it remains to be seen to what extent the Korean Workers’ Party promotes economic development in North Hamgyong province. Here in an account of his visit to Chongjin we get some sense that Kim Jong Il (and his retinue) seems focused for once on the needs of the extreme northeast. Reading a regrettable mind on his face the President recalled an old saying that if subjects worked hard the king would feel at ease and said he was a subject of the people and the latter was the king so he should work hard to make the people live an easy life. In this very interesting dispatch regarding a seminar in Tokyo about forced labor of Koreans during WWII (including 10,000 killed in the firebombing of Tokyo in March 1945), North Korean media seem to be holding out an olive branch to Japan while looking at the Second World War in a slightly different light. As a country that knows something visceral about having civilians bombed, this kind of linkage in the North Korean context isn’t something that should be taken lightly. Then again, when North Korean authors get their digits wrong and accuse “Unit 713” (rather than the proper “Unit 731”) of burying Koreans in Shinjuku Ward in Tokyo, you know the prevailing strangeness is unlikely to clear. When the young people become standard-bearers in the advance for a great surge and work hard with youthful vigor, their hearts afire, our country would leap higher and faster, translating the noble intention and desire of President Kim Il Sung into a brilliant reality. The Korean youth are loyal vanguard who devotedly defends the headquarters of the revolution in the van of the advance for a great surge, ranks of brave fighters who make breakthrough of advance on the most difficult and labor-consuming fronts in building an economic power and pace-setters and pioneers in pushing back the frontiers of science who powerfully demonstrate the dignity of Songun Korea with great scientific and technological achievements. Fighter-bombers and pursuit-assault planes are flying into south Korea one after another from their bases in Japan, and flying corps of the U.S. 7th Air Force present in south Korea are staging madcap exercises for intensive strikes at targets in the depth of the DPRK, close air support, air battle and naval support in coordinated operations with flying corps of the puppet air force, inciting a war atmosphere. This evermore undisguised adventurous saber-rattling is creating such tense situation on the Korean Peninsula that a war may break out anytime [ed. : just in case we didn’t get the point in the previous sentence?]. 2. The units of the three services of the KPA should keep themselves fully ready to go into action in order to blow up the citadel of aggressors once the order is issued. 3. All the men and officers of the KPA and the members of the Korean People’s Security Forces, the Worker-Peasant Red Guards and the Young Red Guards should undergo intensive training in the spirit of Mt. Paektu in each drill ground with the will to wipe out the enemy and keep themselves highly alerted to mercilessly crush the aggressors should they intrude into the inviolable sky, land and sea of the DPRK even 0.001 mm. 4. All the people across the country should make a great leap forward in the general charge to build a thriving socialist nation, their hearts burning with hatred against the enemies, each holding a rifle in one hand and a hammer or a sickle in the other. The order of the KPA Supreme Command is the most just measure for self-defence to devotedly protect the headquarters of the revolution and the prosperity of the country and the eternal happiness of the people from the reckless moves of the war maniacs for aggression. And here is a lesson in globalization for you: This dispatch describes how Kim Jong Il went to Sinuiju in the year 2000 and “with a gloomy expression,” said” it is more important at present to supply shoes to local people than to export them to other countries.” Dear Leader! Sure this reassures us that you aren’t going to sell out the North Korean economy to the Chinese, but, as for those sneakers, to where would you export them? 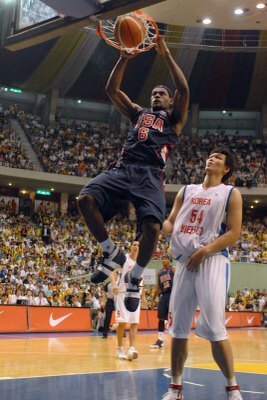 In neighboring Dandong and Liaoning province, PRC, the most logical export market for goods manufactured in Sinuiju, North Korea’s competition for the sneaker market is now LeBron James. Nobody beats the King. This evermore undisguised adventurous saber-rattling is creating such tense situation on the Korean Peninsula that a war may break out anytime. 1. The men and officers of the KPA on the frontline and coastline and those standing on air guard should reliably defend the outposts of the country so as to repel at a single stroke any attempt of the aggressors to make a preemptive strike.